Korean bonds rallied as comments from the Bank of Korea (BOK) chief and the overnight results from the U.S. Federal Reserve policy meeting suggested moderation in the pace of rate increases in the face of growing downside risks to the global economy. 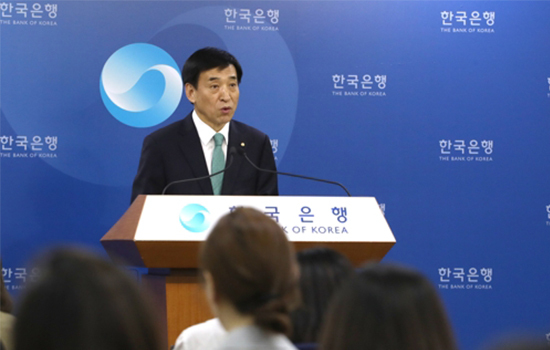 The Fed statement that it would be “patient” in future rate adjustments and the removal of the phrase “future gradual increases” suggest its shift to a more conservative monetary policy, BOK Governor Lee Ju-yeol said on Thursday. The change will likely “affect monetary policies not just in Korea but in many other central banks,” he added. The U.S. central bank, in this year’s first policy meeting on Wednesday, kept the fed target range steady at 2.25 percent and 2.50 percent. Fed Chairman Jerome Powell said in a news conference after the statement that the case for raising interest rates has “weakened somewhat,” citing slowing global growth, trade frictions, Brexit uncertainty and risk of future U.S. government shutdowns. Future rate moves would “depend entirely on the data,” Powell said. Korean government bond prices, which move inversely to yields, were lifted Thursday by the dovish tone from the central bank chiefs. The three-year government bond yield fell 1.8 basis points to finish at 1.809 percent. The longer-dated bond yields fell faster, suggesting bets on a lengthy hiatus in rate increases. The 10-year government yield slipped 5.0 basis points to 2.001 percent and the 20-year paper yield down 5.7 basis points to 2.050 percent. 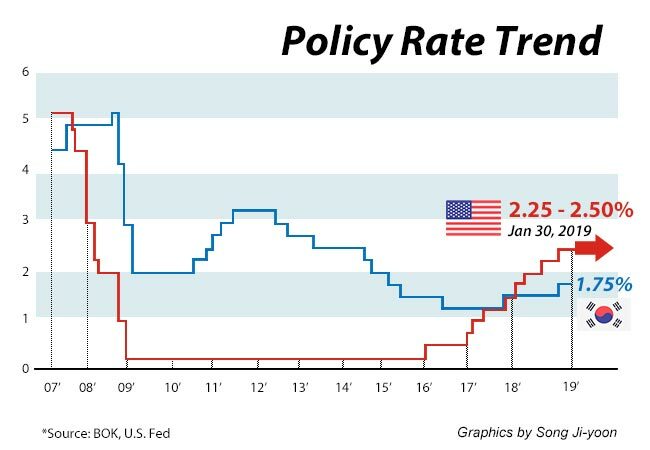 Following the Fed’s shift in tone, the Korean central bank would have more room to maneuver in its monetary policy. Faster raises in U.S. rates up to this point had put great pressure on the BOK, which had been reluctant to move as fast due to the economic slowdown at home. The widening rate gap between the two countries, however, forced the bank in November to deliver its first rate hike in a year. At its first meeting for this year last week, the BOK kept its benchmark rate steady at 1.75 percent, citing no signs of recovery in the economy.